The vision of a billion people practicing EQ is incredibly ambitious… what would it take to “level up” to say: What if EVERY person had the support to grow and practice their emotional intelligence? What kind of future could we cocreate if we could tap this innate human capacity to connect, grow insight, and live on purpose? To make that happen, who would you want as a partner? Let’s dream big… how about the United Nations and UNICEF? 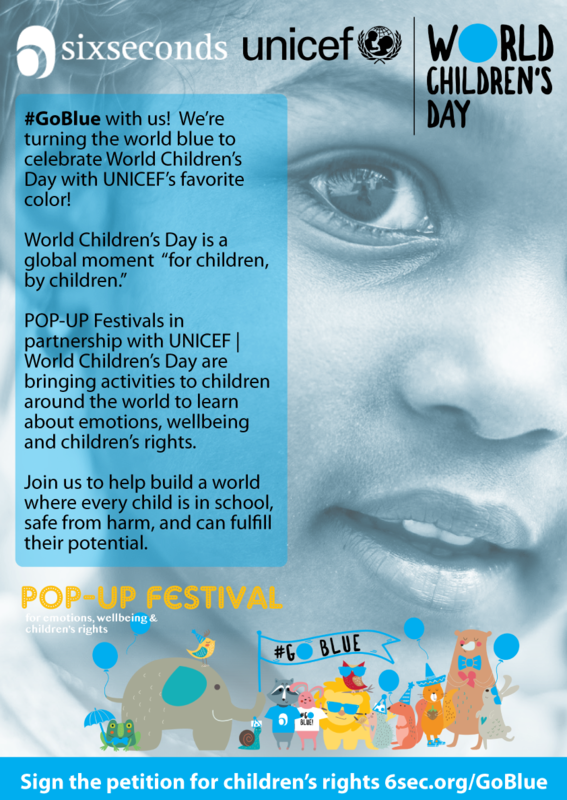 UNICEF, POP-UP Festivals, and YOU! Today is the Global Day of Action, the date the U.N. launched the Sustainable Development Goals. Six Seconds is a U.N. Action Partner because we know that the learnable, measurable, scientifically validated skills of emotional intelligence are an invaluable ingredient to a flourishing future. Emotions are a “100% renewal energy” source — they can fuel us to connect with ourselves and one another. Gain insight to see what’s truly important. And fuel us to step forward with purpose. By growing and practicing emotional intelligence to supercharge all our goals. Isn’t that something we want for EVERY child and adult? While this is a long-term, deep and complex challenge – it’s fun and it makes life better. UNICEF’s “World Children’s Day” (what the U.N. calls “Universal Children’s Day”) — November 20 — commemorates the signing of the Declaration on the Rights of the Child and Convention on the Rights of the Child, the most-signed human rights legislation in history. This day celebrates the progress that’s been made, and the potential for more. For UNICEF, World Children’s Day is a “movement by children, for children” — and the POP-UP Festival is a perfect pairing with these goals. We’ve developed special “Stations” for the POP-UP Festival to support UNICEF’s theme: #GoBlue (because blue is the color of our home when viewed from space, and the color of the U.N. & UNICEF logos). We are encouraging participants to support a visual petition to #GoBlue on Nov. 20 and to sign on to UNICEF’s petition for children’s rights. For all the details about POP-UP Festivals and to join the community of volunteers sign up ! 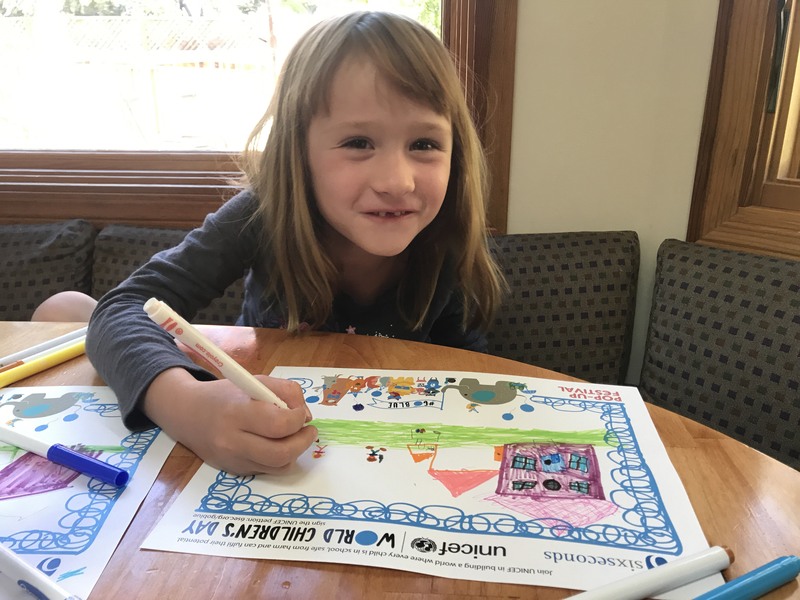 Here’s one of our official “POP-UP Beta Testers” working with the Rights Pictures activity — one of the powerful new stations created for UNICEF’s #GoBlue. She is “going blue” for the right: children will not be soldiers and will not fight in wars. Respectable entity and best of luck for all employees .I learnt alot from your posts and notifications. I love childhood and i am ready to fight against childrens violence .